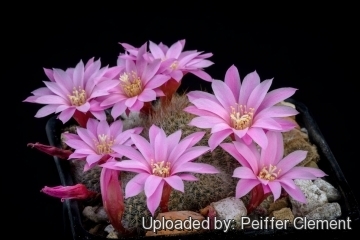 Description: Rebutia narvaecensis is a small clustering cactus, branching at ground level to form low groups or mounds up to about 15 cm wide. It forms a showy bouquet of pale rose-pink flowers from the lower half of the almost globular, softly spined stems. The myriads of flowers sometimes completely hides the plant. They are very floriferous. 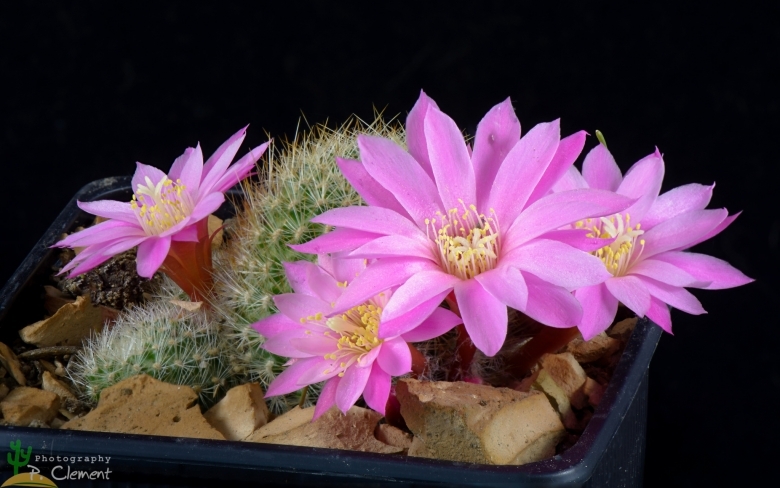 Rebutia narvaecensis is sometime included within (as a synonym of) Rebutia fiebrigii. The plants of R. narvaecensis are generally quite uniform. Stems: Globose, greenish-grey, slightly depressed apically, 3-3.5 cm high, 2.5-3.5 cm thick, with fibrous roots. Ribs: 18-22, arranged in spirals and forming low tubercles approx. 4 mm wide and 2 mm high. Areoles: Circular, prominent, l, 1.5-2 mm long and 1 mm wide, creamy white to brownish. Spines: 10-30, hardly distinguishable as radials or centrals , thin, needle-like, straight, spreading, whitish to yellowish, 2-3(-5) mm long. Central spines up to 6 sometimes somewhat darker. Flowers: Often numerous, borne on the sides of the stems from older areoles, whitish pink, to pale rose pink, 4-4.2(-4.5) cm long and in diameter with a thin tube. Flower bud spherical, 3-4 mm wide, pink, covered with tiny, dark pink scales, white haird and several yellowish bristles. Tube noticeably thin, only 2-2.5 mm wide, about 22 mm long, outside pale pink, covered as well as a the flower bud by scales. Outer perianth segments lanceolate, up to 20 mm long and 5 mm wide, pink or white with a medium pink strip. Inner perianth segments slightly longer and wider, lighter to white. Stamens white, protruding 7-10 mm from the top of the flower tube. Anthers light yellow. Style about 25 mm long, white, protruding at least 10 mm, from the flower tube. Stigma-lobes 6-7 light yellow, exerted above the level of the highest anthers. Fruits: Spherical, about 4 mm large, pinkish brown, covered with several scales. Seeds: Brown-black, hemispherical to helmet-shaped with large basal hilum. Rebutia albipilosa F.Ritter: "White-haired Crown" It is a plant from northern Argentina.The body is made invisible by countless long, soft, hair-like white spines.It produces vibrant orange-red flowers. Rebutia archibuiningiana F.Ritter: The body is made invisible by glassy-white to yellowish, silky, short spines. It produces vibrant orange-red flowers. Distribution: Tarija, Bolivia. Rebutia donaldiana A.B.Lau & G.D.Rowley: "Donald’s Red Crown"n" It develops a dense clump of small, dark heads with brown spines which make a perfect backdrop for the small, dark orange-red, numerous flowers. It quickly begins to form a large, tight mound and it then proceeds to hide it all under a dense blanket of its flowers. Rebutia fiebrigii (Gürke) Britton & Rose in L.H.Bailey & L.H.Bailey: "Flame Crown" It’s a Bolivian mountain cactus, found at 3600m altitude, and therefore very hardy. It forms a cylinder about 6cm diameter and 10cm tall with few offsets and it produces striking, flame-red flowers over a long season. Rebutia fiebrigii var. azurduyensis (J.de Vries): has yellowish to brownish, silky, short spines and peculiar white blooms. Distribution: Azurduy to La Angostura, Bolivia. Rebutia fiebrigii var. densiseta (Cullmann) Oeser: has stronger and very dense brownish spines. Distribution: Chuquisaca, Bolivia. Rebutia hoffmannii Diers & Rausch: similar to Rebutia spinosissima, with denser, very fine, tight, white spines, with brownish tips, and outer petals with purple-reddish shades. Distribution: Argentina (Salta) and Bolivia (Tarija). Rebutia lateritia n.n. : has brick red flowers. Distribution: Potosi to Ballestro, Bolivia. Rebutia muscula F.Ritter & Thiele: "Little Mouse" It comes from south Bolivia; it is distinguished by its soft white spination and orange flowers and it blooms heavily in May, continuing until September/October with always at least a few flowers. It is especially desirable for the small size of its main body, with the offsets held closely, usually in a pattern reminiscent of a classical sculpture. Cultivation and Propagation: Rebutia fiebrigii comes from mountainous areas, so like bright light, and cool and dry conditions in the winter. The whole Rebutia fiebrigii complex has delightful flowers and the plants remain compact, and clumps can easily be managed by division. It is easy to cultivate and recommended for beginners.